The novel concept of rebirthing short sea shipping into what it once was or could be, may remain just that, a novelty. It would be paramount to overcome the “my way, on my terms” philosophy that so heavily drives traffi c away from the seas and inland waterways and onto asphalt freeways that cannibalize natural resources. The plight of road warriors may even further drive coastal commuting straight into Davy’s Locker with the rapidly expanding de- velopment of non-marine-use shore side infrastructure. The waterways may be unclogged of traffi c, but if they offer little to no practical places for docking, the purpose is diluted. Somehow, the concept of a working maritime waterfront has, over time, become less appealing than the allure of highly profi table seaside condos and retail space. Transportation planners also fail to maintain a solid grasp on the concept of intermodal transport. It typically takes two to tango and when both people and freight are shipped they will likely still require land side transport to their fi nal destinations. This lack of vision or oversight recently forced a well known vessel operator to modify and lower the pilot house superstructure of their vessels when the city’s plans for a new low clearance bridge would essentially block his ves- sels into a small section of a major river. Despite rationaliz- ing the impact, the unaltered bridge plans prevailed. All of this is clearly a case of short sightedness, begging for change. Francisco, vessels came to the rescue when the Bay Bridge has experienced closures and when the local rail transit workers of B.A.R.T. went on strike. But, if these events fail to convince, the environmental card can also be played. Jones Act does create some barriers against making marine transport economically feasible. Boat builders will make the case that properly designed and constructed vessels will provide a certain level of cost savings that enables com- petiveness. In many cases, builders can provide contem- porary designs that make marine transport faster, better, cheaper, and even greener. The comparison has been made that a gallon of diesel can move a ton of freight 155 miles over land, but the same gallon has the potential to move a ton of sea freight 576 miles. Yes there are some semantics that can be argued over direct land routes versus round- about waterways, but close examination of America’s Ma- rine Highway systems shows many of the defi ned water routes paralleling land based thoroughfares. 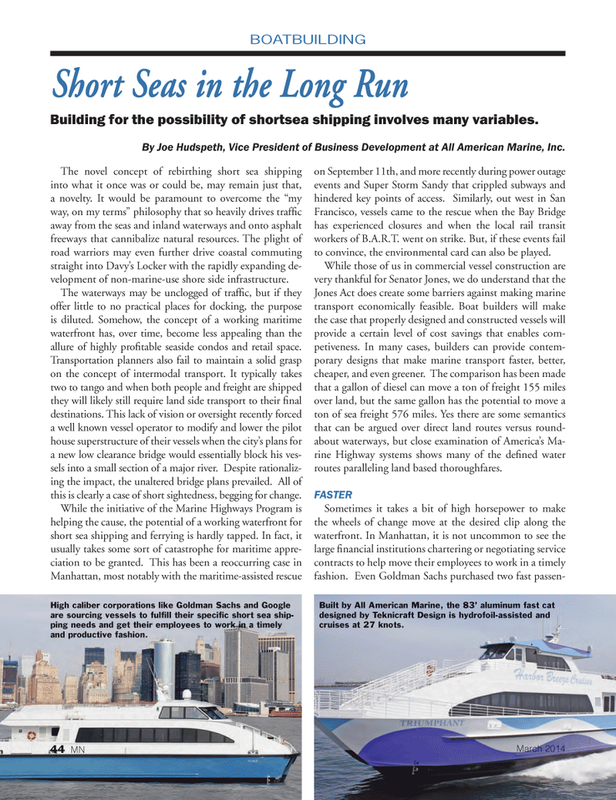 Building for the possibility of shortsea shipping involves many variables. By Joe Hudspeth, Vice President of Business Development at All American Marine, Inc. Built by All American Marine, the 83’ aluminum fast cat designed by Teknicraft Design is hydrofoil-assisted and cruises at 27 knots. High caliber corporations like Goldman Sachs and Google are sourcing vessels to fulfi ll their specifi c short sea ship- ping needs and get their employees to work in a timely and productive fashion.